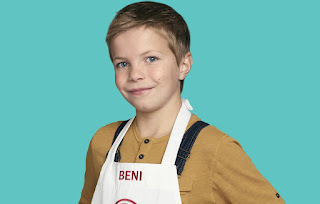 It feels fair to say that Beni Cwiakala had quite a run this season on MasterChef Junior — she won challenges, took on many tough dishes, and at the end of the recent finale, was declared the winner! She now has a chance to join an elite group of other past winners who have gone on to do some fun things in food. It’s an amazing opportunity, just as much of the experience beforehand was amazing in its own way. So what does Beni have to say about her win, the highs and lows of this competition, and what is next for her? Take a look at the interview below for more. CarterMatt – Congratulations! How hard was it to keep your victory a secret? Beni – It was really hard, because sometimes when my friends asked where I was, I would want to boast, “I WAS ON MASTER CHEF JUNIOR!! !”, but instead, I would say, “I was on a business trip with my dad.” When I could finally say it, it was such a relief! Has it started to settle in just yet? What was the hardest part about doing that final challenge? I think the hardest part was how much pressure there was and how much was on the line. If you messed up one thing, it would be all over. I knew that and since I chose ingredients that I have never used before, it made it even more stressful. What did you learn about yourself through doing the show? I learned that if I set my mind to something and focused, I can achieve great things. I also learned that if I am frazzled, all I need to do is take a deep breath and continue. Is there anything that you would tell other young home cooks hoping to be on the show someday? My advice would be to always be yourself, and when you are cooking, put your heart into your food, don’t be afraid and most of all, HAVE FUN!! What are you hoping to do in the world of food next? I am hoping to inspire more and more kids to cook, use healthy ingredients and start to cook with their family as a group. It brings people together and teaches them a skill that no one can take away from them!